Is this a mockumentary? Every person interviewed -- for and against circumcision -- is so ridiculously cartoonish that I can’t tell which “side” is being championed. Funniest film I’ve seen in years, although I'm not sure if it was meant to be! 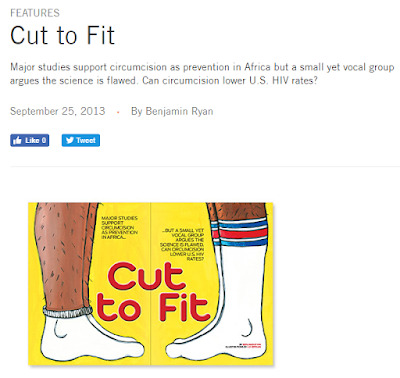 I wrote this article linked below for POZ magazine some years ago about all the crazies who refuse to believe that voluntary medical male circumcision prevents HIV transmission in Africa. Boy did they play tricks to try to refute the superb results from three randomized controlled trials proving that circumcision reduces female-to-male HIV transmission. In the years since I wrote the piece, the evidence just keeps rolling in, including findings that circumcising males lowers a community's HIV rate among females. Also, those studies found that sexual satisfaction was comparable among men randomized to receive circumcision compared with those randomized not to receive it (all men had to be willing to receive one to participate in the studies). Read HERE. I could not even get halfway through this film. UGH !